Oakland County James Hardie Siding | Oakland County James Hardie | Oakland County James Hardy Siding | Oakland County James Hardie Fiber Cement SidingMcGlinch & Sons CO.
McGlinch and Sons Home Improvements has served the Detroit metro area and southern Michigan for four generations. We’re family owned and operated, and we offer incredible exterior home construction, as well as high quality products such as Pella Windows, Velux Skylights, James Hardie Siding and Boulder Creek Stone, roofing, doors, gutters and decks for any project! Moreover, McGlinch and Sons always provides incredible customer service. We aim to provide clients with a memorable experience that’s not only professional, but also personal. You can be sure that you’re getting the ideal products for your home when you choose McGlinch and Sons. Are you in need of new siding? Consider James Hardie Fiber Cement siding. Made with highly advanced technology, James Hardie siding is built for beauty as well as durability. As a James Hardie Elite Preferred Remodeler, we know that you’ll be satisfied with our professional installation and outstanding customer service. Not to mention, McGlinch and Sons also has the Master Elite roofing certification from GAF, which places us among the top 2% in the business. For superior products, a personal touch and friendly and efficient installers, call McGlinch and Sons. Oakland County, Michigan is a county that encompasses a number of northwestern Detroit suburbs. It has a population of about 1.2 million, the second highest in the state. The county seat of Oakland County is Pontiac. McGlinch and Sons Home Improvement, which serves all of southern Michigan, is the first place Oakland County residents should go for any exterior home improvement project. Whether you need new roofing, skylights, siding, windows, doors, gutters, stone installation, or a deck, you’ll find a licensed, insured and manufacture certified contractor at McGlinch and Sons. Furthermore, we carry and install enduring and attractive James Hardy siding. In fact, we offer a variety of styles of Hardie siding as well as other James Hardie products, including everything from standard plank or shingle siding, to vertical siding, and even trim, panels and weather barriers. Or, looking for new gutters that are capable of keeping themselves clean? We have gutters for any need from rain removal to gutter protection systems that stop leaves, sticks, pine needles and other debris from getting stuck. In addition, Oakland County clients can rely on us for gutters that are durable and effective due to our gutter and leaf protection certifications. So when you need an experienced exterior home improvement contractor in Oakland County, Michigan, your first stop should be McGlinch and Sons. 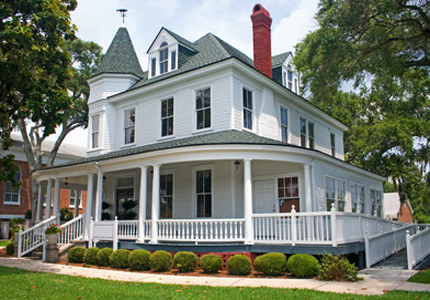 McGlinch and Sons Home Improvement is committed to providing the same expert customer service that we have since 1917. That’s why we often train our service and installation crews and teach them to collaborate with clients and help them select the perfect products for their home. Our goal is to meet all of the requests you have for your home improvement project. If you need siding that is durable, good looking and highly rated, we often recommend James Hardie siding. Hardie siding is engineered to last and the unique designs can help you get the look you want. When it comes to replacing the siding on your home, James Hardie, James Hardy siding will most certainly have what you’re looking for. McGlinch and Sons also offers several other exterior home construction services, including roofing, stone installation, deck design and installation, skylights, doors, gutters and windows. Call us at (248) 987-6300 in Oakland, (586) 777-8912 on the east side, or (313) 278-2777 on the west side, and start planning an efficient home improvement project that will add value and interest to your home.